I had the calculator class running on my Mac. 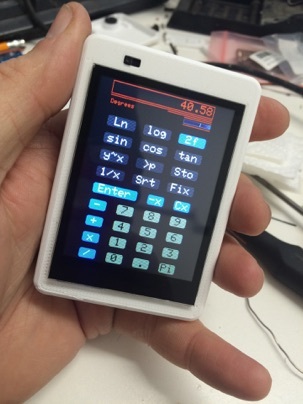 I had some Arduinos, seem to always have some about, and a 2.8” capacitive touchscreen from Adafruit. I put the two together and, well.. It just didn’t have enough RAM to do much. I got it to work. But I could only put on a subset of the buttons. Sad day, so I put it away and went on to other things. Then one day I ran across the Uncanny Eyes project by Phillip Burgess. That introduced me to the Teensy 3.2 µ processor. 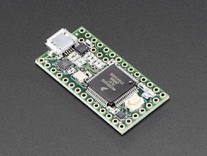 Its like an tiny Arduino with LOTS of RAM. 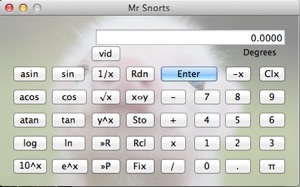 It actually all started with Mr Snorts.. I grew up with HP calculators. So RPN was what I’m used to. Sadly, RPN calculators are not so easy to come by anymore. So one day, I decided to write one for my Mac. Macs have changed too. What’s this C# stuff? Can’t make heads or tails of it! So I wrote the “brain” of the calculator in straight c++ and the interface in.. Uggh! C#. I was so lost in the interface builder that all I could figure out was to just send in the text of the button label to the “brain” and have it figure out what to do with it. In the end, it turned out to be a bonus. I ended up with this really cool c++ RPN calculator class that interacted with button label key clicks. I could recompile it on an Arduino. What fun! But what to use for an interface? I had this old touchscreen from another project..
And that’s how all this nonsense got started. Next: We have all the missing pieces.